I love this pumpkin cozy! Also, the little apple sweater in the latest Martha Stewart Kids magazine has very nearly convinced me to learn to crochet. I’ve been happily busy, but I hope to get in time to make a pumpkin cheesecake and maybe some caramel apples this weekend. Epicurious Halloween recipes including pasta dishes with pumpkin, I must try. Also Smashing Pumpkin Martini. I want to know how they were sewn, actually. Ask Metafilter on ways to cook brussles sprouts. Scott loves brussles sprouts, I always thought they tasted like ink. But the roasted brussles sprouts recipe in the Everyday Food magazine #7 is so good that it converted me (mmmmm). Ask Metafilter on how to poach an egg. I grew these clover from tiny seeds using the Four Leaf Clover Kit, it’s amazing they are still alive. They are doing much better after I set them out to get rain water, I’m not so good at remembering to water plants. But, still no four leaf clovers. The Knitty Fall Surprise is up and it’s been Boing Boinged because the use of a Creative Commons license is of interest, so it might be difficult to reach for a little bit. Download site #2 worked for me. It’s a special mini-issue created to spread awareness as a tool to help fight breast cancer, and the patterns are freely given to be printed and distributed under license terms. Bravo Knitty! Pink pumpkins in a store display. For Breast Cancer Awareness Month? Probably but the people working in the shop looked kind of angry about my picture taking so I didn’t stick around to ask. Skulls! Laura sent me a link to these brilliant Day of the Dead bath fizzies at Yodelingfish. I totally had the same idea a few years back (I swear!) when I bought some Day of the Dead sugar skull molds. I wanted to embed babydoll heads or plastic bugs in the skull bath molds, but never found a good way to get it all to stick together when they were that large. Also, take a peep at the Chocolate Skull with Gummy Worms at Dylan’s Candy Bar, it’s creepy despite being almost entirely sugar. Link via Awful Cufflinks. I bought sugar skull molds from the speedy and really friendly Reign Trading Company, and I see they have added a bunch of skull molds to their offerings, yay. They offer full instructions and recipe (with pictures and everything) for sugar skull making at mexicansugarskull.com. They include tips for making sugar skulls with a larger group of kids. They also have chocolate skull recipes for tempered chocolate, chocolate wafers, or chocolate chips. I think I’m in love with these people. p.s. 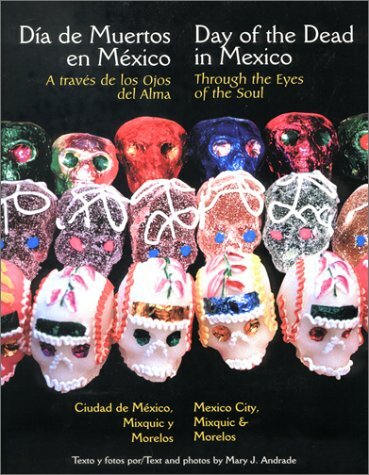 Take a look at the transparent skulls on the cover of Day of the Dead in Mexico Through the Eyes of the Soul — larger picture. Fruit gel I’m supposing. Those are neat. Colored table salt – I like the green on the eggs. Though, I do like it better in its less novel but more festive margarita salt incarnation. Via J-Walk Blog, who else? Cooking For Engineers has started a Deals Blog to keep track of sales and well priced kitchen items, just in time for me as I’ve been wanted to get a real, actual chefs knife. If you havn’t checked out Cooking For Engineers yet by all means do, the recipe charts make a whole lotta sense to me and, being a comically bad cook, I appreciate the basics. While I’m thinking of basics Da*xiang laid out chicken types in Chicken 101 and the definitions of Natural, Kosher, Free Range, Organic and Conventional, very helpful. Also, Fig and Plum offers this recipe for Idiotically Simple Apple Crisp. Mmm. There is a Rebecca Home issue, the pillows on example page 6 (I cannot link right to it, sorry) remind me a bit of those latch hook pillow kits. via Action Hero. I bought little pumpkins this year, I think I’m going to buy more, they are just so cute. I was really happy I packed Scrabble. Whole Wheat Radio is compiling a community cookbook which promises to be intersting. Growing up we had a collection of old church/PTA/association cookbooks and there are some really interesting recipes in there. Via J-Walk Blog.